What Time of Year Should You Move? The tedious process of moving (relocating to a new place and starting life over) is comprised of a lot of out-of-pocket expenses, some that are planned and some that might catch you off guard. It is a good practice to plan ahead with moving expenditures so that you are on track time-wise and budget-wise. Listing all your moving costs on a spreadsheet lets you get a bird's eye view of various expenditures that are going to be incurred during your move. 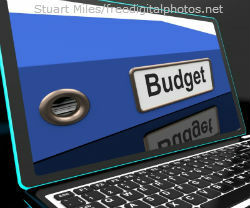 You can find various moving budget templates on the Internet. These spreadsheets can be changed and updated as per your needs. A bookkeeper's record book is a portable option, but you may have to change some column titles or entry boxes. Certain fixed expenditures at your current residence are unavoidable and mandatory. After enumeration of your fixed costs, you should determine the cost of moving your belongings. It is advisable to obtain estimates from at least three moving companies. This will allow you to compare the costs and services offered by different companies. It also gives you the bargaining power when making the final decision. Aside from the cost of using a moving company, you should calculate costs for insurance and tips for the movers. DIY moving for short distances has its own pros and cons. The downside of it is you might incur extra costs in the form of fuel, insurance and tools such as a loading ramp and handcart. If you are utilizing packing services, a good rule of thumb is that 25% of moving costs should be designated for packers. The cost of packing supplies should be included in the budget. The costs incurred during the moving process are quite varied and range from your plane tickets to fuel and snacks. After moving into your new home, a variety of expenditures are incurred that range from fixing up your new residence, to utility services. TIP: It is a good gesture to serve food and drinks to people who have helped you move in. Grocery shopping after you first moved in is going to be expensive as you have to stock up your kitchen with all the essentials. Once you have added up all your costs in a spreadsheet, add an additional 5 to 10% of your total cost. This buffer amount will account for any hidden costs during the move. Examine the final statement and if the amount exceeds your expectations, then review the budget and cut costs by removing unnecessary and/or your least necessary expenses.